Earlier this year, a slew of press reports discussed the possibility of a Mexico-USA high speed rail link from the industrial powerhouse of Monterrey in Nuevo León state to San Antonio in Texas. (For one example, see Fast train to Monterrey on the horizon). The reports say that Mexican transport officials and their U.S. counterparts believe that this international high speed rail link could be in operation within a decade. The new line would move passengers between the two cities in about two hours, saving almost three hours compared to highway travel. 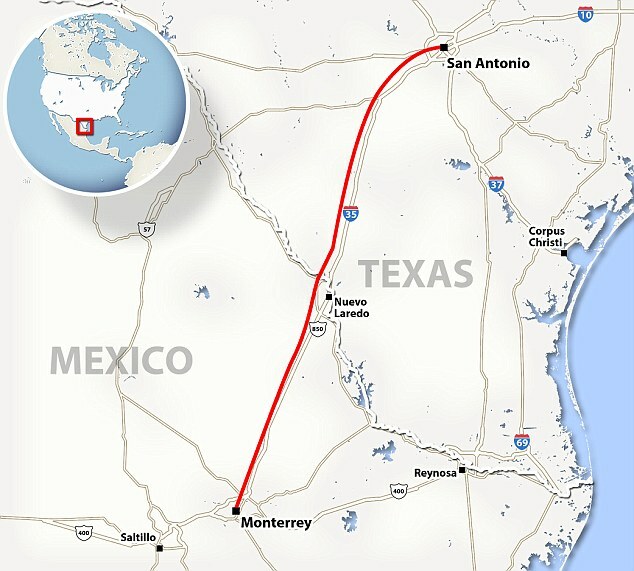 Route of proposed high speed train from Monterrey to San Antonio. Credit: Daily Mail. A key part of the plan would be a system to pre-clear U.S. Customs which sometimes delays northbound motorists at border crossings for several hours. (Such a pre-clearance system would be analogous to that already operating in several Canadian airports, where U.S.-bound passengers clear U.S. immigration and customs prior to boarding their flights). Mexican officials have already secured the rights of way for the rail line from Monterrey to the U.S. border and say that this section of the line, likely to cost around 1.5 billion dollars, could be up and running as early as 2018. The U.S. section, from the border northwards, is unlikely to be completed before 2022 at the earliest, though a $5.6 million study of potential high-speed rail lines stretching from Laredo to Oklahoma City is already underway. The first high speed rail links in North America are likely to be in Mexico, where planning is well advanced and the first construction contracts are being awarded for building high speed links from Mexico City to Toluca and Querétaro. Plans for a high speed train in the Yucatán Peninsula have also been announced. For more details of the Mexico City-Toluca high speed rail project, see Plans to improve the Mexico City-Toluca transport corridor. Will the SA/Monterrey High-Speed Rail Line Really Happen? A recent Washington Post article – Mexicali has become Mexico’s city of the deported as U.S. dumps more people there – highlights the fact that Mexicali now has the dubious distinction of receiving more deportees from the USA than any other Mexican border city. The U.S. Immigration and Customs Enforcement (ICE) agency deported more than 400,000 migrants in the 2012 fiscal year, and close to 370,000 in 2013, about two-thirds of them to Mexico. Mexican government statistics for that time frame show that more than 110,000 were “repatriated” to Mexicali, even though it was not their point of origin, or even the closest Mexican border city to where they were detained. According to the Mexican Ministry of Foreign Affairs (SRE) the deportees from the USA in 2012 included 13,454 unaccompanied Mexican minors under the age of 18. This Washington Post graphic (click image to enlarge) neatly summarizes the situation. 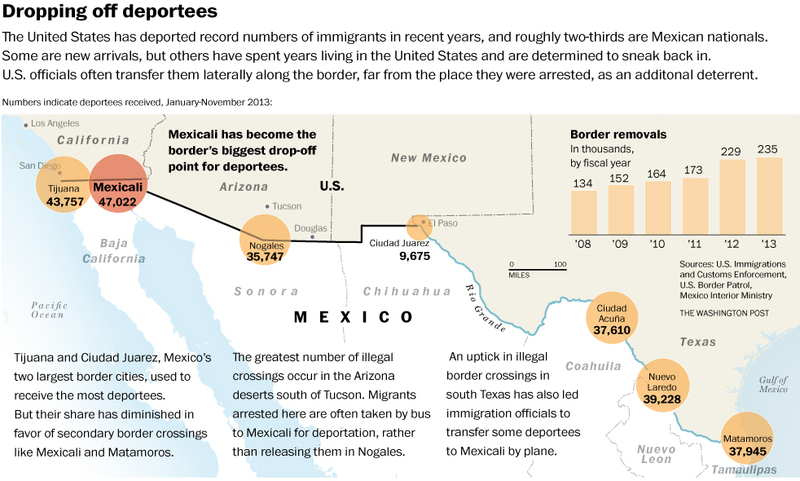 Number of people deported to Mexico’s border cities. Click to enlarge. Credit: Washington Post. The Washington Post article makes for some sober reflections on the plight of many of those deported from the USA, especially those individuals who have very strong family ties to that country. The longer term social effects of such deportations are the focus of this article by Joanna Dreby, assistant professor of sociology at the University of Albany, State University of New York. In this post, we consider the unfortunate plight of the Tohono O’odham people, whose ancestral lands now lie on either side of the Mexico-USA border. Following Mexico’s War of Independence (1810-1821), the rush was on to draw an accurate map of all of Mexico’s territory. Mexico’s boundaries following independence were very different to today. At that time, the major flows of migrants linking the USA to Mexico were from the USA to Mexico, the reverse of the direction of more recent flows, where millions of Mexicans have migrated north. 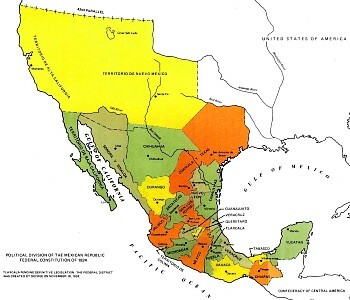 As this map of Mexico in 1824 shows, Mexico’s territory extended well to the north of its present-day limits. At the end of the Mexican-American War (1846-1848) the 1848 Treaty of Guadalupe Hidalgo ceded over half of Mexico’s territory to the USA. 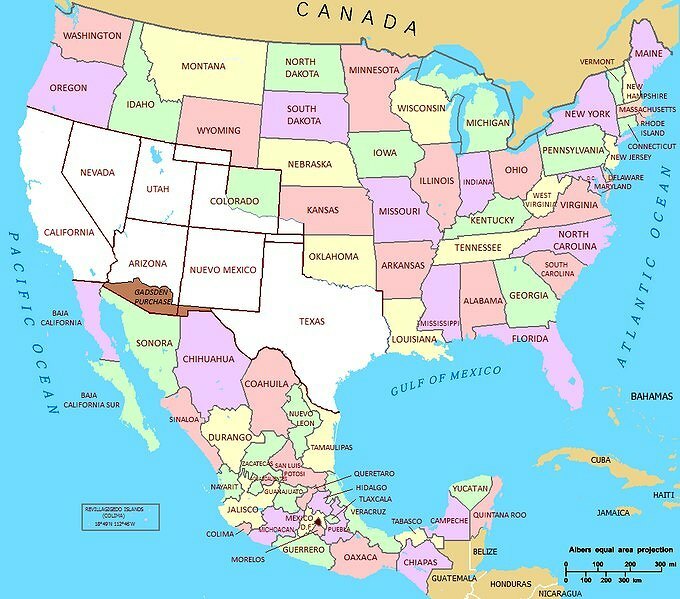 A few years later, under the 1853 Gadsden Purchase (Treaty of La Mesilla), northern portions of Sonora and Chihuahua (shaded brown on the map below) were transferred to the USA. With minor exceptions since, to take account of changes in the meanders of the Río Bravo (Grande), this established the current border between the two countries. One of the immediate impacts of the Gadsden purchase was to split the lands of the Tohono O’odham people into two parts: one in present-day Arizona and the other in the Mexican state of Sonora, divided by the international border. The O’odham who reside in Mexico are often known as Sonoran O’odham. There are an estimated 25,000 Tohono O’odham living today. Most are in Arizona, but about 1500 live in northern Sonora. In contrast to First Nations (aboriginal) groups living on the USA-Canada border who were allowed dual citizenship, the Tohono O’odham were not granted this right. For decades, this did not really matter, since the two groups of Tohono O’odham kept in regular contact for work, religious ceremonies and festivals, crossing the border when needed without any problem. Stricter border controls introduced in the 1980s, and much tightened since, have greatly reduced the number of Tohono O’odham able to travel freely. This is a particular problem for the Tohono O’odham in Sonora, most of whom were born in Mexico but lack sufficient documentation to acquire a passport. Since 2001, several attempts have been made in the USA to solve the “one people-two country” problem by granting U.S. citizenship to all registered members of the Tohono O’odham, regardless of their residence. So far, none has succeeded. The largest community in the Tohono O’odham Nation (the Arizona section of Tohono O’odham lands) is Sells, which functions as the Nation’s capital. The Sonoran O’odham live in nine villages in Mexico, only five of which are offically recognized as O’odham by the Mexican government. 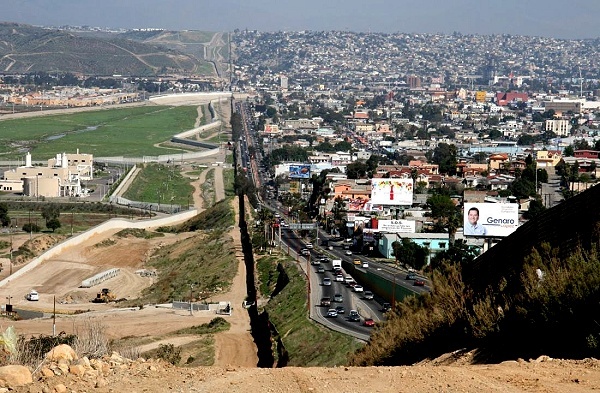 The border between the two areas is relatively unprotected compared to most other parts of the Mexico-USA border. The Tohono O’odham Nation is often called upon to provide emergency assistance to undocumented workers (and drug traffickers) from south of the border who have underestimated the severe challenges of crossing this section of the harsh Sonora desert. Tribal officials regularly complain about the failure of the U.S. federal government to reimburse their expenses. ABC News reports (Tohono O’odham Nation’s Harrowing Mexican-Border War) that the border “has made life a daily hell for a tribe of Native Americans” and that drug seizures on the Tohono O’odham Nation’s lands have increased sharply. This 30 minute video (narrated in Spanish with English subtitles) looks at the vexed situation of Mexican workers that have been deported from the USA back into Mexico. About 200 migrants are deported daily. Almost all are male,. Many of them have lived for several years in the USA prior to deportation, and some have wives and families still living north of the border. 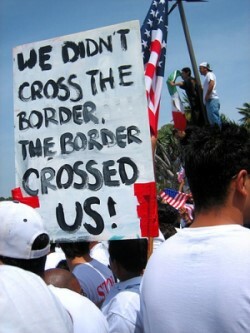 About 45% of all migrants from Mexico to the USA crossed the border between Tijuana and California. Since 1994 (Operation Gatekeeper) crossing the border has been made progressively more difficult. The border is now heavily protected with border guards given access to technology such as night-vision telescopes and a network of seismic monitors (to detect the minor ground movements that signal people walking or running through the desert). As the US economy ran into problems a few years ago, the flow of migrants north slowed down, even as authorities in the US launched more raids against undocumented workers, leading to an increase in the number of workers deported. In the video, a range of stakeholders are given the chance to explain how they see the problems faced by deportees. 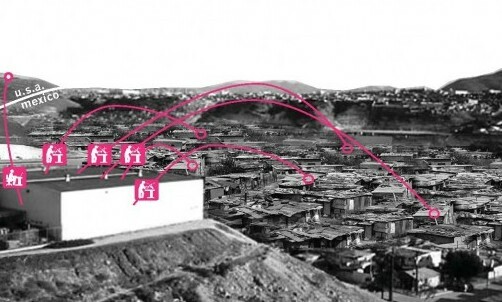 A social anthropologist provides some background and academic insights; activists explain their position and how they seek to help deportees; several individual deportees share their experiences and invite us into their “homes”, precarious one-room shacks, some built partially underground, hobbit-like, in “El Bordo”, a section of the canalized channel of the Tijuana River that runs alongside the international border. The garbage-strewn El Bordo has sometimes housed as many as 4,000 deportees. Mexican authorities are anxious to clean the area up and periodically bulldoze any shacks they find. These personal stories of workers from interior states such as Puebla are harrowing. Many still seek “the dream” and openly admit they do not want to return to their families as a “defeated person”. While parts of this video might have benefited from tighter editing, the accounts are thought-provoking and the video is an outstanding resource to use with classes considering the longer-term impacts of international migration. There seems little doubt that a majority of the “residents” of El Bordo has a serious drug problem, and the video includes interviews about this issue with municipal police, deportees and aid workers, who discuss the problems and suggest some possible solutions, but ultimately, the city and state authorities have some tough decisions to make if they are to resolve this serious, and growing, humanitarian problem. In a previous post – Update on the severe drought in northern Mexico – we mentioned two cases where water was being transferred across the Mexico-USA border and where it was proving impossible to meet the terms of existing water treaties in the face of the severe drought in northern Mexico and the southern USA. In this post, we look at two examples where the major trans-border concern is about water quality not quantity. The New River begins in Mexico as the Río Nuevo and receives agricultural runoff and industrial and domestic wastewater from the 1,000,000 or so residents of the metropolitan area of Mexicali, where a water treatment plant now operates. The New River then crosses the border northwards into California (west of the Colorado River) and flows into that state’s largest lake, the Salton Sea. The New River is about 130 kilometers long, with only the first 25 kilometers in Mexico. The trans-border drainage basin of the New River. Credit: IBWC. 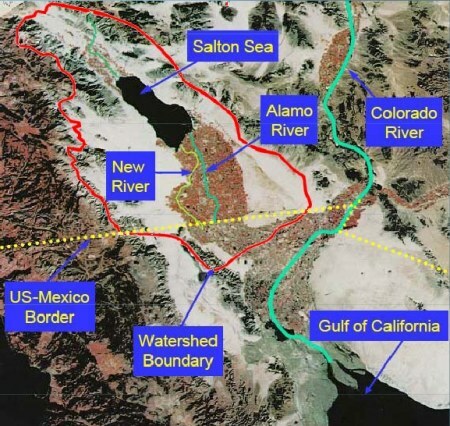 The California-Mexico Border Relations Council’s technical advisory committee recently announced a strategic plan to start cleaning up the polluted waters of the New River. In the Californian border city of Calexico, the plan calls for the installation of a 90-million-dollar water disinfection system and trash screens. Downstream, it also includes the creation of water-filtering wetlands in parts of the Imperial Valley, one of the USA’s most important agricultural areas. The strategic plan will also develop an integrated water quality monitoring and reporting program, so that changes in water quality can be quickly traced to source and any necessary cleanup measures can be implemented. The condition of the New River has been improving in the past decade, but much work remains to be done. Case 2: Wastewater in Nogales, Arizona. Further east along the border, Arizona state officials are suing the International Boundary and Water Commission (IBWC) for violations to the United States Clean Water Act, alleging that untreated Mexican industrial wastewater, mixed with domestic sewage, continues to cross the USA-Mexico border into the city of Nogales, Arizona. The suit claims that the wastewater has levels of cadmium, cyanide and ammoniacal nitrogen well above legal limits. The Arizona Department of Environmental Quality is demanding that the IBWC install an industrial waste treatment system at the Nogales International Wastewater Treatment Plant. This image of the Mexico-USA border tells its own story. Tijuana is on the right, San Diego on the left. ﻿InfraNet Lab is “a research collective probing the spatial byproducts of contemporary resource logistics.” Given its emphasis on spatial aspects, it includes many topics of interest to geographers. This is a well illustrated account of the spatial changes associated with maquiladoras, and includes a variety of useful maps and graphics. Shanty towns support maquiladoras. Credit: Juan Robles/InfraNet Lab. 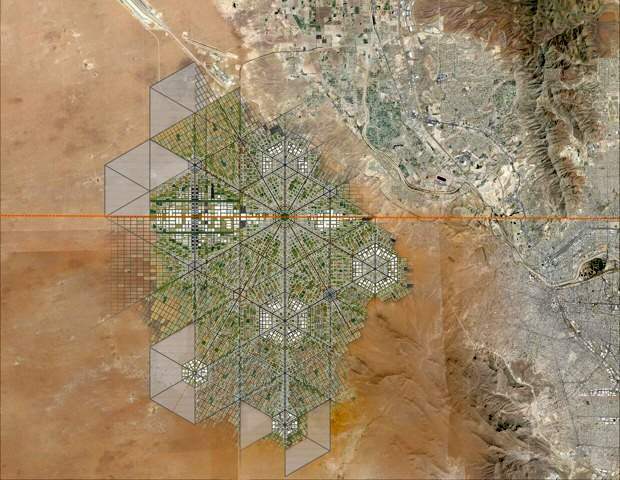 The globe’s networked ecologies of food, water, energy, and waste have established new infrastructures and forms of urbanism linking dispersed entities. 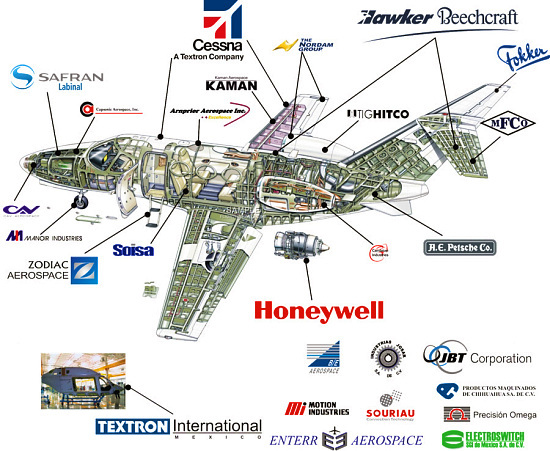 These agglomerations evolve and shift as resources are uncovered or depleted. While these ecologies exist at the service of our contemporary lifestyles, they have typically remained hidden from view and from the public conscience. 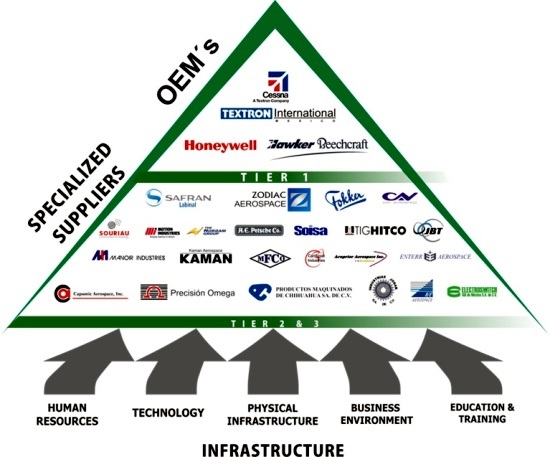 Yet as resources of food, fuel and water begin to run scarce, new resources are mined and new networks develop. This means that InfraNet Lab offers some very valuable resources for ﻿courses such as the IB Geography’s Paper 3 for Higher Level students which looks at the impacts of all kinds of international interactions.